The fresh scent of lemon is invigorating first thing in the morning. And if you love the flavor of lemons — or sweet lemon bar desserts, you’ll love this Lemon Bar Shakeology recipe. In this Shakeology recipe, we amp up the flavor factor with creamy Vanilla Shakeology, fresh lemon zest, vanilla extract, and use real lemon juice to transform that sweet, tangy lemon bar flavor into a healthy smoothie. 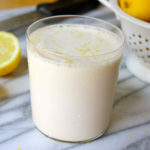 This smoothie uses real lemon juice and grated lemon zest to get the sweet and tangy flavor of a lemon bar. Place water, ice, Shakeology, lemon juice, extract, and lemon peel in blender; cover. Blend until smooth.